Torben Holm Larsen, Technical Director and co-founder of Real Relief, a private sector company behind products like Supertowel, SafepadTM and NetprotectTM. Torben has been working with developing and supplying innovative products for the humanitarian and development sector for almost 20 years. Starting with Long Lasting Insecticide treated Nets (LLIN) to fight malaria and since a.o. water filters, shelters, reusable sanitary pads and lately Superowel. He is a chemical engineer with almost 30 years of experience within everything from product development, manufacturing, sales and management. 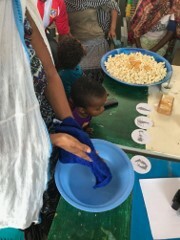 Sian White is a Research Fellow in the department of Disease Control at the London School of Hygiene and Tropical Medicine (LSHTM) and is currently doing her PhD on hygiene behaviour in humanitarian crises. Sian has over a decade of experience working on projects to do with hygiene, behaviour change and public health programming in Australia, Asia, the Pacific, Africa and the Middle East. Sian’s research largely involves participatory qualitative methods to assess behaviour, or process and impact evaluations to assess interventions.